Research has shown that 82 per cent of Welsh speakers say that they are more inclined to choose a company that provides a good Welsh language service. Small businesses across Wales will be able to access free of charge Welsh language support thanks to a new Welsh for Business initiative launched in Pembrokeshire today. Minister for Welsh Language and Lifelong Learning, Eluned Morgan AM, was present at the Welsh in Business, ‘Sense of Place’ business event held at Haverfordwest Farmers Market to launch the national service that will allow small businesses across Wales to benefit from dedicated Welsh for Business officers based in 12 locations throughout Wales. The event gave businesses from the area a chance to learn about the service as well an opportunity to hear from Visit Wales and St Davids Kitchen, on the value of ‘sense of place’. The service is a Welsh Government initiative that forms part of the long-term vision to see a million people speaking and using Welsh by 2050. Welsh for Business officers will offer a wide range of support services including translation of menus, social media messages and promotional materials. Officers will also work with small businesses that account for 94.9 percent of the total enterprises in Wales, on how to increase their Welsh language customer services, with the aim of improving Welsh language interaction between staff and customers. They can also help businesses by directing them to learning providers that will help improve Welsh language skills, instructing them on how to recruit Welsh speakers and learners, and facilitating an understanding of who their customers are and why the Welsh language is important to them. Welsh for Business Officers can also offer support on how to market and promote a business among Welsh speakers and advise on local networks that can support businesses. And in a bid to make the Welsh language more visible, they can also provide signage translations, such as welcome, open and closed signs as well as notices informing customers that Welsh is spoken and encouraged by the business. 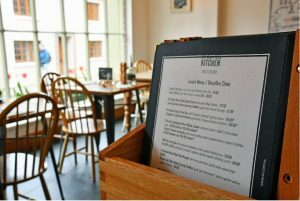 During a pilot project, the Welsh for Business officers have already helped a number of small businesses, including St Davids Kitchen, a ‘farm to fork’ restaurant in Pembrokeshire. Owner Neil Walsh said: “Our Welsh for Business officer, Heledd, was very helpful when we asked for her support in making St Davids Kitchen more appealing and engaging for our Welsh speaking customers. She became an invaluable resource, and wasted no time in supplying us with Iaith Gwaith (Working Welsh) badges and open/close signs. 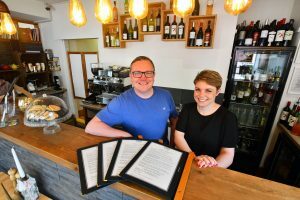 “We then decided to further develop our use of the Welsh language, and with Heledd’s help have translated our market menu. The bilingualism has been the subject of many compliments from our patrons, and is always well received. Minister for Welsh Language and Lifelong Learning, Eluned Morgan, said: “Although many small businesses want to support the Welsh language, they may lack the time and know how to fully commit to bilingualism. Our officers are working hard to support SMEs by offering a mentoring service and signposting them to relevant resources.